Angled corners. 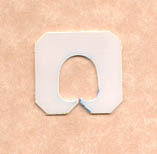 Body size 21 mm x 22 mm. Rare due to the fragility of its hooks.